Shattered by the death of his wife Amanda, antiquarian bookseller Peter Byerly is drifting through life aimlessly when he stumbles on the Victorian miniature that so forcefully reminds him of her. Peter becomes obsessed with learning the picture's origins. But as he follows the trail back, first to the Victorian era and then to Shakespeare's time, he learns much more than that. The truth about his own past, for example; and even possibly the key to the mystery of who really did write Shakespeare'e plays. 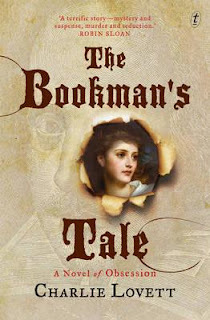 The Bookman's Tale is a novel of timeless love and dangerous obsession by a writer at the peak of his powers. It will enthral and delight readers everywhere. Enthralling this book certainly is, but I don't know about delightful. There are several things about this book that failed to have the desired effect. For example, the main character Peter Byerly. Peter is a naturally anxious person who is shy almost to the point of it being medical, and later in the book it is implied that he has a social anxiety disorder. After Amanda's death, Peter withdraws from the world and focusses on his book business, but he is given a list of goals by his psychiatrist that includes tasks like "Reconnect with old friends." Peter does not do this, unless you count his talking to the spectre of his wife that seems to follow him around. I think Peter's plight is supposed to arouse our sympathy. We are supposed to want to hug the bereft widower, but I really just wanted to get away from him. Peter's sad-sack qualities made for large chunks of internal monologue which were all thought and no action. When action sequences DID come along, they moved expediently from point A to point B, leaving me as a reader feeling a little cheated. I also got a sense of inconsistency and transparency from Peter. When he suddenly foiled the baddie in one of the final chapters, it seemed like too far a stretch for his character entirely, and I was not amused. Mild mannered detective Peter is not. While his manuscript question does lead him around the place, more of the truth is revealed to the reader in historical vignettes than through Peter's scholarly attempts, and it appears that the real story occurs not in Peter's present but in his, or someone else's past. This novel is as ambitious in it's scope as Elizabeth Kostova's The Historian, but falls short of its literary predecessors. It certainly had the potential to be just as good, if not better, if it had been given more time to pan out. After all, The Historian is a book some 800 or so pages long for a reason. The strength of this novel lay in its narrative tension. Lovett knows how to keep his readers hanging on. Just as I was feeling my interest wane, something big would happen. Lovett would give just enough information to tantalise and then end the segment, moving around in time so that you would have to read on to find out what next. Structurally I would give this novel a four, but as for plot and skill of execution, it's a two for me. Sorry!